Why? That was the question that I got asked most frequently when I told people the whole concept behind my goal race for 2017. Why would you EVER want to do something like that?!?! If you were 48 years old or younger, you were given 48 hours to run. If you were over 48 years, you were given an hour for each year you are old. The finish time for everyone was Monday at noon, and we went backwards from there to determine our start times. That meant that those of us “young folks” started at noon on Saturday. It was a little weird to be considered one of the young folks when I’m over forty! Why did I choose this race in particular? After all, I love trail running and I love point to point races even more. I prefer to not see the same scenery more than once, much less every mile, and tend to choose races that have very technical, challenging courses! This race is on pavement (some asphalt and some concrete) and runs in loops around a city park. The same scenery over and over and over and, well, you get the idea. I chose this race for many reasons. 1. After having a HORRIBLE race year in 2016, I was on a mission to have a great 2017. So far, it has gone very well. A timed event means there are no DNFs. If you finish one loop you have been successful. 2. 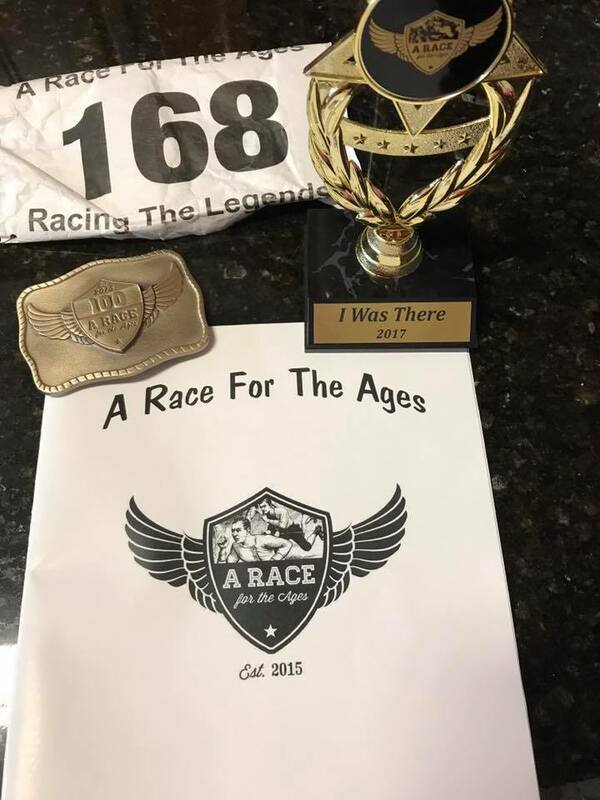 I wanted to complete another 100-miler and I thought that a timed event would be a new challenge for me. 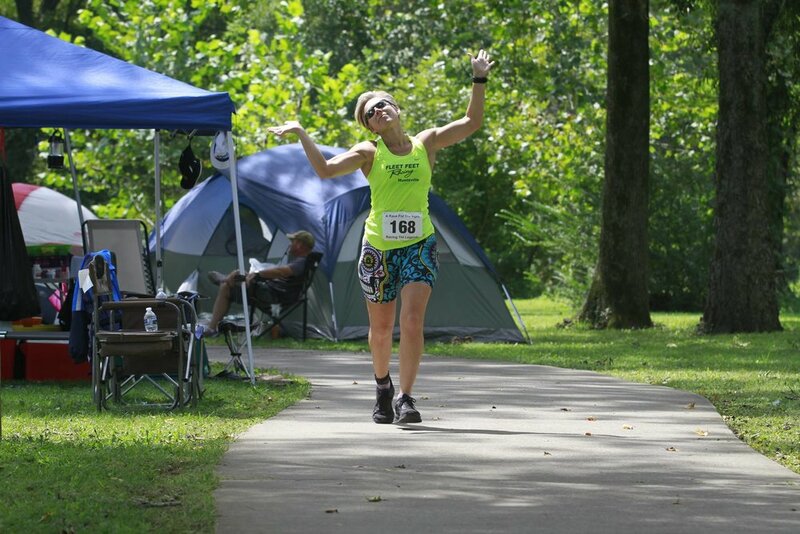 The longest timed event I had ever done was the Delano 12-hour in Decatur. It would allow me more time to achieve my 100 mile distance, while allowing me the opportunity to surpass 100 miles, which I had never done before. 3. A looped course would allow me the chance to see if I could run a long-distance race with no crew or pacers. My husband always crews for me (which I love), but I have always wondered if I would be capable of doing it on my own. It just so happened that my parents recently moved and were in a position to use some help with organizing and moving things into their new places, so my husband volunteered to do that while I was running this crazy thing. 4. This race is full of ultra running legends! I was very much looking forward to getting the chance to walk with, run with, and talk with people who have accomplished amazing things in their lifetimes. Never have I been part of a race that is so full of inspiration and experience. Typically, I run a lot of my races with very little talking. I get into my own head and stay there, focusing on the task at hand. I wanted this to be different. I wanted to talk to these people and learn as much as I could, soaking up their knowledge and experience. I trained smart, with a little less mileage than my typical 100-mile training, but ran almost every day. I continued my strength work 5x per week, as usual. I still feel very strongly that strength training improves running endurance and performance greatly! It most definitely helps with injury prevention! I knew that I would have to be very organized, since Tony would not be there crewing me this time. He was going to be spending the weekend at my parent’s house, helping them get some work done around their house. He planned to come and see me at the finish on Monday. He usually does all the thinking and I do all the running. Everyone knows that he is the “Crew Master”. I have always wondered how I would do running a race of this distance solo, and what better way to try it out than on a loop course?! I started organizing things early in the week and making lists and checking things repeatedly. 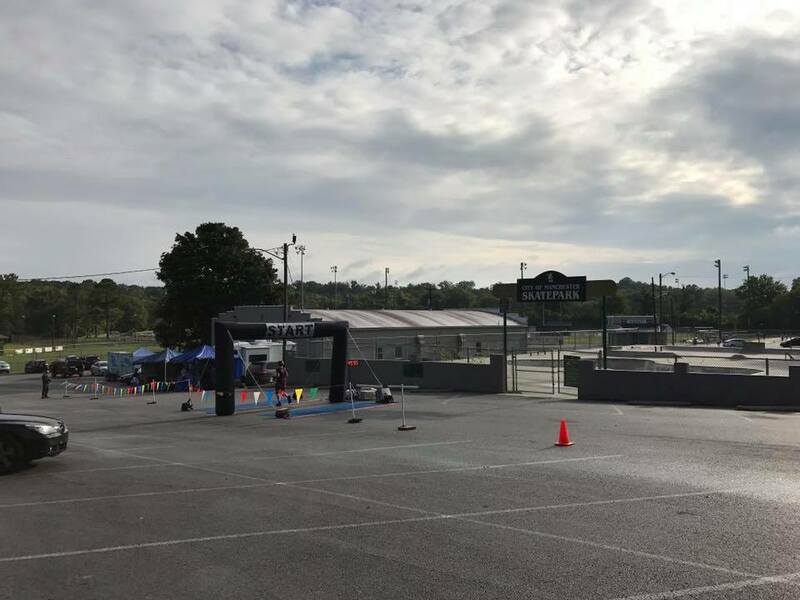 My plan was to drive up Saturday morning a couple of hours before our start, set up my aid area near the course, then rest until start time. I got there, set up the canopy, my cot, and all of my gear, then relaxed a bit, and waited until my other Huntsville friends showed up. I had two clients who were coming to attempt their very first 100-mile finish, so I was excited for them and to be there to help them. 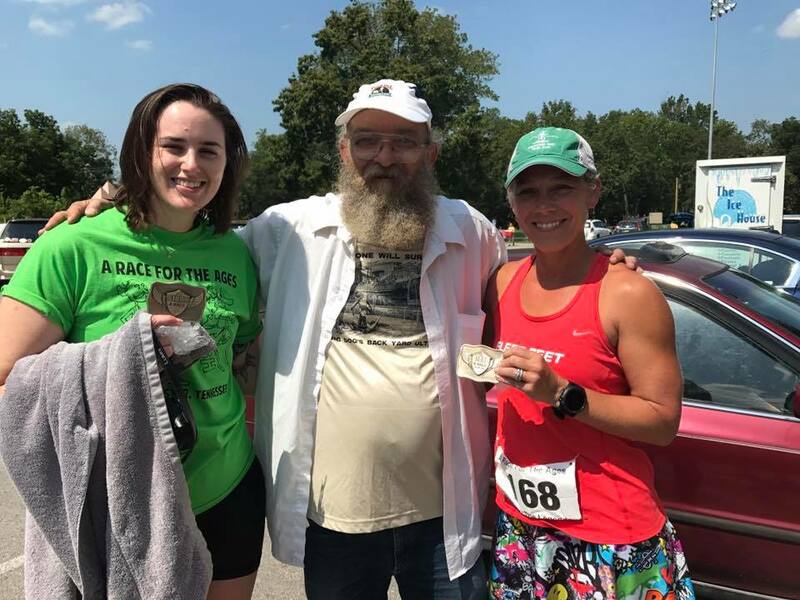 My plan was to run my first 100 miles at my pace, then help them reach their goals with whatever mileage they had left by that time. I wanted to go the entire 48 hours with as little rest as possible and run as many miles as I could. I knew that I should easily be able to hit 120-130 miles or so. The weather was also looking to be perfect for us! We started at noon on Saturday and I eased into a walk/run plan that included 5 sections of running, with 5 sections of power walking. Each walking section has a slight incline, which I knew would continue to “grow” as the race went along. The tiniest little hill turns into a mountain as you rack up mileage! I felt very steady and like I was at a pace that I could hold the entire time. I was able to run quite a bit with Colleen (one of my first time100-milers) since our pace was similar. I spent lots of time talking with the older runners that had started before us. I was in awe of the things that they had accomplished in their lifetimes. I have always enjoyed talking to older people and learning as much as possible from them. I wish more younger people did as well. They are a wealth of knowledge that you can’t get in books. It’s inspiring. I made very few stops and continued on through the night. The weather was ideal and I wanted to take advantage of the sun being down. I started listening to Kevin Hart’s new audiobook and ended up listening to the entire thing. It was 13 hours long and kept me entertained! That guy is hilarious. I decided to lay down and try to nap at about 5 AM on Sunday. I set an alarm for 8:15 AM and laid my seat back in the car. I had put my cot on the back edge of my canopy and the moisture from the evening had dripped onto the cot, causing it, as well as my pillow and blanket to get soaked. So, the car was my next option. Oh well. I struggled to sleep. I would fall asleep for 20 or 30 minutes, then wake up in a panic, feeling like I had slept for hours, and was missing the race! This happened multiple times, so at 8 AM, I turned the alarm off, went to my aid station and got a bagel thin with peanut butter for breakfast. I ate it as I walked on the course to warm back up. I then eased back into my normal run/walk pattern from the day before, feeling good. I finished my 100 miles around 8 PM on Sunday and decided to nap for one hour before I joined Colleen on her final miles. I laid on the cot, as it had dried during the day. But, I could not fall asleep. I could hear every noise around me and just couldn't get comfortable. I finally fell asleep, but only managed about 15-20 minute of sleep. I got back up, waited for Colleen to come back around to their aid station setup and found out that she only had 6 more miles to go! I joined her and we fell back into the run/walk pattern again. She was tired, but was still moving well. We saw Chelsea several times on the course and I could tell that she was struggling. I told her and her mother and husband that I would be joining her as soon as Colleen hit her 100-mile finish. They seemed relieved to hear that. Colleen hit her mileage and after we collected her buckle and finisher’s award, I went off to find Chelsea. She was having stomach issues, as well as lots of issues with her feet and blisters. She still had about 21 miles to go, and I told her that I was going to do them all with her. We walked and made our way around the course, discussing our plan for rest, etc. We determined that she had enough time to take a one-hour nap, so she went to their aid station setup and napped in the tent that they had set up. I walked a lap while talking to my daughter on the phone, then stopped into the community building where they were serving soup at midnight. It was just what I needed! There is just something wonderful about hot soup in the middle of the night during an ultra. The saltiness was great! I went back out and did another lap after my soup, then went to collect Chelsea to start back up again. She felt a little better after her nap, and we trudged along. Her fatigue set in again, so we decided that one more one-hour nap was needed. This time, I decided that I would also nap. I had been up and moving almost the entire time and knew that I would need some rest. This was around 4 AM on Monday. I slept HARD during this nap and made up for the lost sleep earlier in the race. I went back to get Chelsea again and we set out to complete her 100-mile finish. Colleen came back to see her finish and decided to do her last mile with us. Around 10:30 AM on Monday, Chelsea completed her 100 miles and I kept trucking along to finish out the 48 hours. I wasn’t really keeping track of the mileage that was showing on the big screen at the start/finish area. I just wanted to keep moving as long as possible and do what I could mileage-wise. Believe it or not, I really felt good. I picked back up with my run/walk intervals. Tony showed up approximately 45 minutes before the end and I was still moving well. When I saw that there was 26 minutes left on the clock the next time that I came through, I told him that I was going to go for one more lap. When I arrived back, there was 12 minutes left and I decided that I had done enough. I would have to run more than walk to get through another lap and what was one more mile anyway? I ended up with 133 miles total. We hung around for the awards ceremony and really enjoyed hearing all of the stories that Gary Cantrell (the RD) shared about all of the runners that he has known for many years. He really makes a race special by adding those personal touches. Colleen and her first buckle! Overall, I really had a great race. This is the first time that I have run this long and had absolutely no issues. No stomach issues. No “dark times”. I really was in a great mood and wasn’t ever overly fatigued, which is surprising. I think that a couple of things helped. One was that since I was on my own, with no crew, I had to think ahead and be prepared as far as fueling, rest, etc. I also was very focused on my two friends that were completing their first 100-milers. I was so thrilled that they completed their races and just wanted to see them succeed. These things kept my mind busy. Watching them collect their first buckles and talking to the older runners were the highlights of this race, for sure. I will definitely go back and do it again. Next time, more miles will go down!